Habit: Generally monoecious annual, to generally dioecious shrub, generally scaly. Leaf: generally alternate, distal +- reduced; blade entire to variously dentate; anatomy Kranz or non-Kranz (see note). Inflorescence: axillary or terminal. Staminate Inflorescence: spheric cluster to spike-like or panicle; bracts 0. Pistillate Inflorescence: cluster to spike- or panicle-like, occasionally 1; bracts 2 per fruit, enlarged in age, free to variously fused, generally compressed, generally sessile, falling with fruit (or not). Staminate Flower: calyx lobes 3--5; stamens 3--5. Pistillate Flower: calyx generally +- 0; stigmas 2. Seed: generally erect. Species In Genus: +- 250 species: temperate to subtropics worldwide. Etymology: (Latin: name derived from Greek) Note: Generally in alkaline or saline soils; some weedy; some accumulate selenium. Bract descriptions refer to 2 bracts surrounding flower, enlarging in fruit. Australian Atriplex crassipes J.M. Black possibly in SCo. 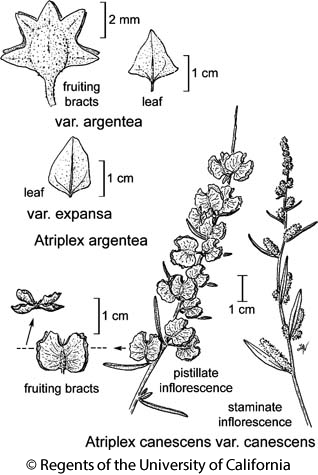 In this revised taxonomy, Atriplex californica, Atriplex joaquinana moved to Extriplex, Atriplex covillei to Stutzia, both new genera [Zacharias & Baldwin 2010 Syst Bot 35(4):839--857]. Kranz anatomy (observable at 10 ×, sometimes only after scraping off scaly, mealy, or powdery layer) characterized by veins that are darker green than rest of leaf, due to higher concentrations of chloroplasts in bundle-sheath cells surrounding veins. Habit: Shrub 3--25 dm, erect; branches many. Stem: branches spreading to ascending. Leaf: blade linear to oblanceolate, densely white-scaly; Kranz. Pistillate Inflorescence: terminal; bracts in fruit 4--25 mm, generally fused to near tip, ovoid to spheric, hard, wings 4, 3--6 mm wide, entire to wavy or deeply sharp-dentate. Seed: 1.5--2.5 mm. Habit: Plant 8--20 dm. Leaf: blade 15--50 mm, linear to oblanceolate; Pistillate Inflorescence: bracts in fruit 6--25 mm, stalked, wings generally 3--6 mm wide, entire to dentate. Chromosomes: 2n=36+. Citation for this treatment: Elizabeth H. Zacharias 2013, Atriplex canescens var. canescens, in Jepson Flora Project (eds.) Jepson eFlora, Revision 1, http://ucjeps.berkeley.edu/eflora/eflora_display.php?tid=54998, accessed on April 25, 2019. SNH (e slope), Teh, SCoRI, SCo, n TR, PR, GB, D. Markers link to CCH specimen records. Yellow markers indicate records that may provide evidence for eFlora range revision or may have georeferencing or identification issues. Purple markers indicate specimens collected from a garden, greenhouse, or other non-wild location.